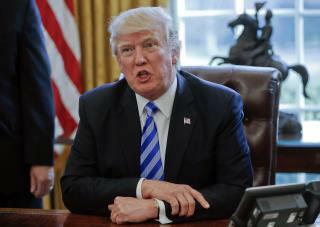 (Newser) – President Trump has been handing out his cellphone number to world leaders and urging them to call him directly, an unusual invitation that breaks diplomatic protocol and is raising concerns about the security and secrecy of the commander in chief's communications. Trump has urged leaders of Canada and Mexico to reach him on his cellphone, the AP reports, citing former and current US officials with direct knowledge of the practice. Of the two, only Canadian Prime Minister Justin Trudeau has taken advantage of the offer so far, the officials say. Trump also exchanged numbers with French President Emmanuel Macron when the two spoke immediately following Macron's victory earlier this month, according to a French official. "Hey just in case I get impeached tomorrow and you still want to hang out...here's my number, call me." "Yeah, I don't think that's gonna...happen."